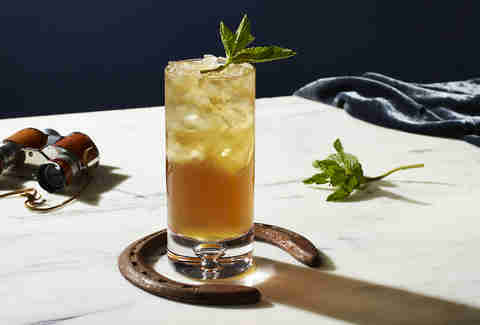 If there’s one thing that every great Kentucky Derby party needs, it’s a good mint julep recipe -- and a good bourbon to go in it. But why play things straight when getting ready for the party of the year? 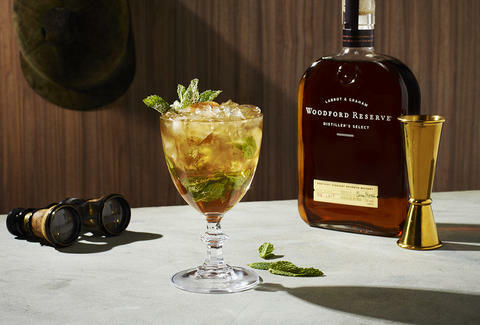 With that in mind, we tasked bartenders across the country to come up with their own unique spin on the mint julep, using Woodford Reserve. So tackle these new takes while you're cheering on your favorite pony come race day. First, make the syrup by taking dried apricots and boiling them down to a concentrated reduction. Then add a part of honey equal to the reduction that's left in your pot. Combine the mint leaves in the bottom of your glass and very gently press the leaves with a muddler, being careful not to pulverize them (it will make your Julep taste vegetal). Add crushed/pellet ice until your glass is around 1/3 full, add the bourbon, give it a brisk stir, fill your glass with ice until it is just shy of the rim, add your sherry, follow up with another short stir to mix the ingredients. Slightly overfill the vessel with crushed ice, and begin garnishing with mint sprigs and piece of apricot (dried or fresh). Be sure to give it a dash of confectioner's sugar over the mint. Toast 1 cup hazelnuts in a pan until golden brown. Add ½ cup water and drop the temperature to low. Cook until nuts are soft. Blend the mix in a blender or food processor until smooth. 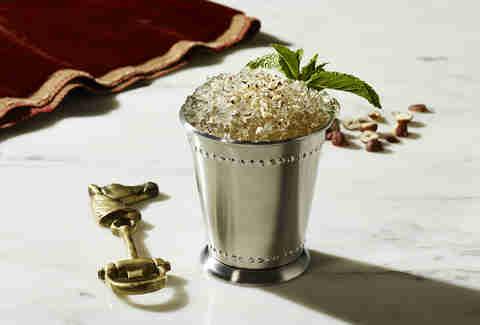 Fill julep cup with a handful of mint. Pour ingredients over ice and mix around with a spoon until glass is chilled. Top with additional ice. Garnish with fresh sprigs of mint and ground hazelnuts. Put mint in a chilled collins glass, and gently press. Add all liquid ingredients and top with crushed ice. Swizzle, float a few dashes of Angostura bitters, some cherry vanilla bitters, and garnish with a mint sprig. To infuse Woodford: toast 1 cup chopped pecans lightly, when somewhat cooled off but still warm, add to a bottle of Woodford Reserve and let sit overnight, covered. Strain through a coffee filter and save the pecans for the brittle. For the brittle: melt 6 tbsp. of sugar in a pan. Once melted (careful not to scorch), add the pecans, stirring quickly. Pour and spread on a greased sheet pan or silicone. Break into pieces when cooled. In a blender, put the first three ingredients and blend. 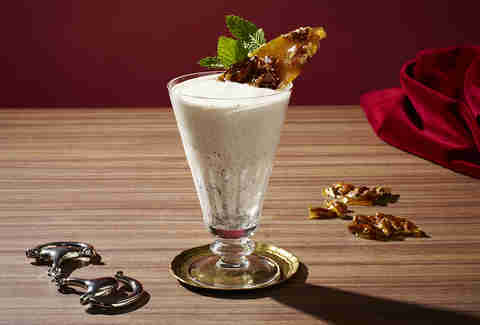 Top with a big ole mint sprig and a chunk of brittle. Stupid good. Gently muddle the mint leaves with the maple syrup to express the oils in a mixing glass. Add the liquid ingredients and stir until combined. Pour all contents into a paper snow cone, make sure it's big enough to hold the two and half ounces of booze, and top with finely crushed ice until the ice is falling off the sides. It's a snow cone, it should be slightly messy. Garnish with the mint sprigs and straw and grin like an idiot while eating! If you don't want a paper snow cone or fun, just put it in a double rocks glass or something. 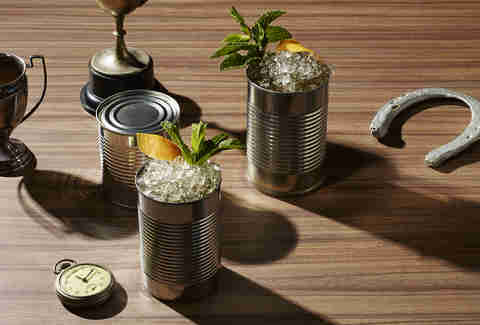 Add 6-8 mint leaves, grapefruit falernum, honey syrup, and bitters to your tin can. Lightly press your mint with a muddler. Add Woodford Reserve and crushed ice. Stir until the cocktail is properly diluted and frost starts to form on the outside of the can. 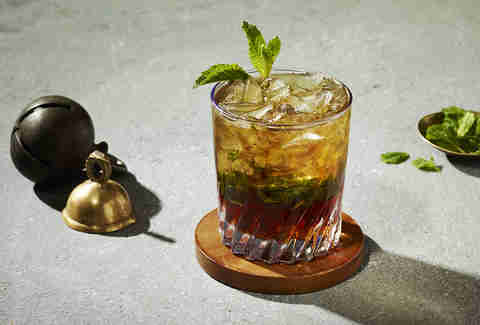 Top with a heaping pile of crushed ice and garnish with a grapefruit peel and 2-3 big sprigs of mint.